Did you know that DislikeOnFb has the power to collect personally identifiable information? Even though this is unlikely to be the purpose of this unreliable ad-supported program, the EULA document reveals that some information collected using tracking cookies could be personally identifiable. Needless to say, it is bad enough that an unreliable program is capable of collecting this kind of information, but it is much more daunting that this information can be disclosed to unfamiliar third parties. If you understand the gravity of this, you will understand why you must remove DislikeOnFb. DislikeOnFb is a browser extension, and our researchers have found that it is compatible with Google Chrome and Mozilla Firefox browsers. 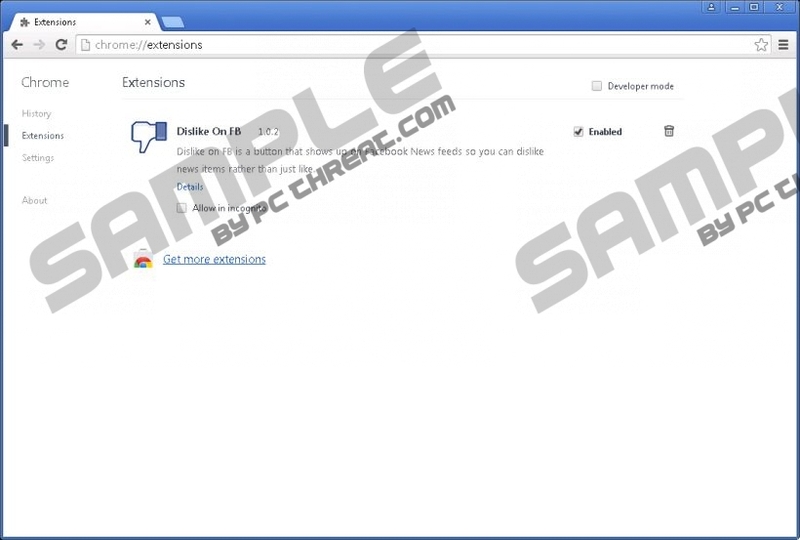 It is possible that users will need to delete DislikeOnFb from Internet Explorer and other web browsers as well, which is why you have to look out for this adware even if Chrome and Firefox are not installed on your PC. All in all, regardless of which browser you use, DislikeOnFb will not work -- at least not in the way it is supposed to. Although this program promises to add a “Dislike” button to your Facebook account, it does no such thing. Unfortunately, not all users delete this program even when they find that it does not work. Just like AllCursors – a program that is likely to have been created by the same company – DislikeOnFb was designed to shown online advertisements. Whether you download this program from dislikeonfb.com or using a third-party installer, it will inject ads into the websites you visit. At first, you might appreciate the coupons, discounts, and other kinds of supposedly beneficial offers, but it should not take long for you to realize that these offers are misleading or useless. It is possible that the creators of DislikeOnFb do not care about what kind of content is shown, as long as users interact with it, which generates profit. In the worst case scenario, you could be introduced to malicious ads if you do not remove this adware. If you have installed DislikeOnFb with other suspicious programs, you MUST analyze them as well. Chances are that we have already reported all unreliable programs whose removal you might be interested in. So run a scanner to inspect your operating system, and use your article database to find information about the threats detected. Hopefully, DislikeOnFb is the only threat that you will need to delete from your operating system. If it is not, you have to make sure that every single piece of unreliable software is removed successfully. DislikeOnFb is a program our malware researchers dislike. This application was created by an unreliable party to get money, and you can be sure that this party does not have your best interests at heart. Clearly, you should delete DislikeOnFb right away, and we have devised a plan that will allow you to eliminate malware from your operating system. First, remove the unreliable extension from your browsers. Next, use a malware scanner to figure out which programs you still need to eliminate. Finally, remove these programs. Install SpyHunter, an automated malware remover, if you cannot erase malware manually. Open the browser and tap Alt+F to access the Chrome menu. Click the recycle bin next to the unwanted add-on and choose Remove. Open the browser and tap Ctrl+Shift+A to launch the Add-ons Manager. Move to the menu on the left and select Extensions. Find the unwanted add-on and click Remove (or Disable if that is the only option). Quick & tested solution for DislikeOnFb removal.